Ice Cold Mist personal bottle misters are portable cooling devices that provide hours of refreshingly cool water misting comfort to beat the most extreme heat. 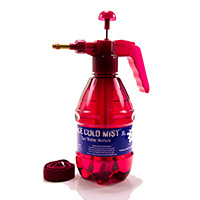 Pump bottle misters are now available in an extra large 1.5L XL size and 8 exciting colors to meet everyone’s needs. 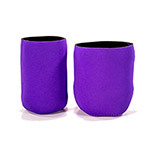 Our chill sleeve koozie helps keep the misting water ice cold for hours. The cooling chill sleeves are also available in all 8 misting bottle colors and can be mixed and matched to create your own unique customized personal pump bottle mister. The personal mister bottle combo with chill sleeve koozie is the perfect way to stay cool at sporting and athletic events, camping and hiking or anywhere you need to beat the heat. Unlike other battery operated personal fan bottle misters, such as the O2 Cool deluxe water misting fan, our personal spray mister bottles don’t require batteries or electricity, saving you money and time. Pump bottle misters work by pumping the bottle with air and then pressing the trigger, that’s it! You get instant cooling relief. The adjustable brass nozzle allows you to spray either a cool refreshing mist or continuous stream of water, perfect for cooling off at the park or back yard water fights. In addition to keeping you cool, personal misting bottles are also ideal for many other spray misting needs, like window tinting applications, spray misting your plants, pet grooming and training, taming the flames on your outdoor grill, wall paper applications and ironing. The continuous water stream can be used for filling water balloons, watering the plants, training the cat or dog or as the best squirt water gun your kids could ever want. Without any batteries or wires to get in the way, like other spray bottle fans, pump bottle personal misters are 100% waterproof and can be completely submerged. You can take them to the pool, to the beach, to the lake or river without worrying about them getting wet, damaged or ruined. Your children can even use the misting bottles to make bath time much more fun! You can also enjoy the relaxing cool water spray of the original pump bottle mister at sporting events, tailgate parties or next camping trip. 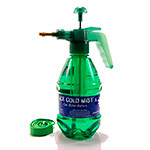 With excellent customer service and great prices, Ice Cold Mist personal bottle misters provide a better value than Misty Mate Misters and O2 Cool Misting Fans. Our 5-star rating and excellent customer reviews speak for themselves. 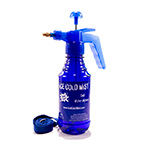 Ice Cold Mist offers the leading water bottle misters available on the market today. We offer the lowest prices on personal bottle misters without the need for coupon codes or promos codes. We also offer wholesale and bulk pricing, quantity discounts, as well as team and league sales.